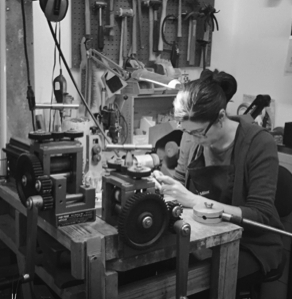 A California native, Kathleen Maley has been making jewelry and art objects in San Francisco for over 18 years. Kathleen studied jewelry and metalsmithing at San Diego State University, then moved to San Francisco’s Mission District to live and work in The City’s diverse artist community. Her jewelry studio and workshop at 1890 Bryant Street Studios, is located inside the historic Best Foods building-- creative home to over 100 artists, painters, photographers, sculptors, printmakers, and ceramicists. Kathleen creates sculptural jewelry that highlights the contrast between sterling silver and high karat gold vermeil, and can be found in galleries and museum shops across the country. Her work is featured in several juried publications. To visit 1890 BRYANT STREET STUDIOS click here.